Built around the new and powerful ?Trident? 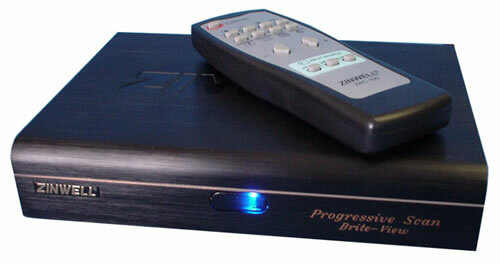 chip, the Zinwell is first budget video scaler I have seen that is able to clean up the image and not throw away the details in its attempt to throw away the scan lines. Motion artefacts too are reduced to a minimum although some scenes did ?stagger? drawing attention to the scaler?s processing speed. The Brite-View provides a wide range of resolutions (640?480, 800?600, 1024?768, 1280?1024 @60Hz and 75Hz refresh), switchable output compatibility (with component or RGB), anamorphic squeeze, a user-friendly remote with direct access to functions and a useful on-screen display. You have to ask why can?t the more costly scalers match the simple functionality of the rookie? The Brite-View is one of the few scalers to be opimised for PAL viewing with their new PAL Plus software. The new resolution offers the most natural and pleasing PAL image I have seen from DVD/off-air broadcast and is worth the extra investment ? it is very satisfying to see PAL replayed so smoothly and seductively. You really have to see it to appreciate it! The Zinwell Brite-View really does take ?image-making? to a new level at its price point. Its immediate syncing when changing resolutions or swapping sources (or TV channels) and simple on-screen functionality makes it a user-friendly winner at any class/price level.